I don´t know why I love thistles...perhaps it´s their beautiful colors in combination with the sharp pins! I´ve used this stamps from Serendipity Stamps and watercolors. Today I made a card for a technique challenge to use No-line- colouring! My card for the challenge on Less is More´s blog! 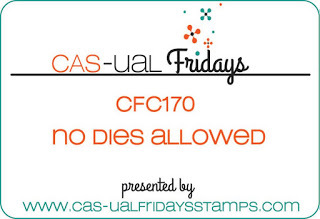 Here´s my card for the challenge at CAS-ual Fridays blog! A card with the beautiful stamps from Penny Black, colored with watercolors! I cut out the vine glass and placed them in a watercolored scene! A card for a CAS challenge "BUNNY" today! By the way there is a Blog Hop going on at Serendipity blog...leave a comment there and have a chance to win a ＄20 gift certificate! March Blog Hop at Serendipity Stamps! There´s a Blog Hop going on at Serendipity Stamps blog!!! A card with the new candle dies from Technique Tuesday! I love white candles! Today I thought I should make a card with a swedish countryside view...the landscape that makes me nostalgic and calm! 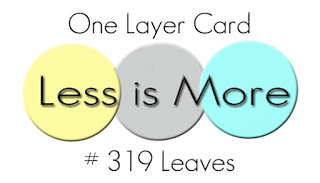 Here´s my card for the OLC challenge "Leaves"
on Less is More´s blog! My card for the challenge on CAS-ual Fridays blog! Love challenges that make me think in new ways! My card for the Wednesday challenge on Simon says challenge blog! Is there any more special ladies then our Mothers..? Here´s my card for the color challenge on CAS Colours & Sketches blog! Here´s my card for the challenge on CAS(E) this Sketch blog! There´s a Blog Hop going on at Serendipity Stamps blog! !